"SHIPWRECK NUESTRA SENORA DE LA LUZ - LOST 1752! LIMA PERU GOLD COIN 1749/8 "PEICES OF 8" ESCUDOS NGC 58! *** THERE ARE ONLY 2 PIECES EVER GRADED BY NGC (THIS IS EASIEST THE NICER OF THE TWO, HAVE SCANS OF THE OTHER PIECE)!!! THIS IS NO ORDINARY GOLD DOUBLOON - IT'S A DOUBLE DATE, A MULE PIECE! THAT IS TO SAY MATTY, IT HAS A 1749 FRONT (PILLAR SIDE) AND A 1748 REVERSE (CROSS SIDE)!!! WITH TWO DIFFERENT ASSAYERS AS WELL - PILLAR SIDE STAMPED "R" (JOSE RODRIQUEZ - SEE THE "R" IN THE LEGEND) AND CROSS SIDE IS JOSE de VARGAS! IT'S VERY DIFFICULT TO SEE, BUT THE ASSAYER "V" IS STAMPED TO THE RIGHT OF THE CROSS! 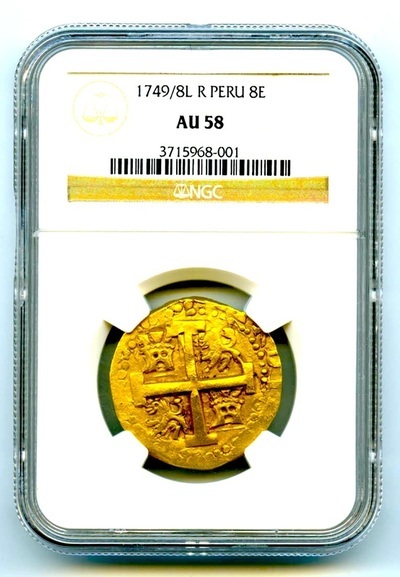 THIS OCCURRED IN RESPONSE TO THE NEW MINT SUPERINTENDENT, ANDRES MORALES, IN 1748, WHOM ARRIVED IN LIMA AND WAS CHARGED WITH CONVERTING THE MINTAGE FROM COBS TO MILLED COINS AND ALSO TO RESPOND TO THE BOARD OF COINAGE WHOM REQUESTED A RE~DESIGN DUE TO FREQUENT MIS~STRIKES AND DUPLICATING (DOUBLING). FERNANDO'S FATHER (KING PHILIP Vth) HAD PREVIOUSLY (1728) ORDERED COLONIAL MINTS TO CONVERT FROM COBS TO MILLED COINAGE, BUT STILL WERE STRIKING COBS UPON MORALES' ARRIVAL AND NEW COMMAND. THIS PIECES OF EIGHT HAS A LARGE ROUND FLAN "VERY VERY RARE (TO FIND SO ROUND)!" INCREDIBLE DETAILS AND BOLD STRIKE - INCREDIBLY RARE AT OVER 250 YEARS OLD AND IN THIS CONDITION! JUST FINDING AN 8 ESCUDOS IS TOUGH ENOUGH, BUT A STRONG STRIKE DOUBLE DATED PIECE IS VERY DIFFICULT, THEN ADD ON TOP OF THAT THE "INCREDIBLE CENTERING" OF THIS HAMMERED PIECE AND YOU REALLY HAVE A WORLD CLASS EXAMPLE! "RARE OPPORTUNITY!" HERE'S SOME INTERESTING FACTS: TAKING A LOOK AT THE REVERSE (CROSS SIDE) YOU CAN SEE THE MAJORITY OF THE PLANCHET IS STRUCK CLEAN & CRISP WITH THE CROSS OF JERUSALEM ALONG WITH "CASTILLE AND LEON" IN THE FOUR QUADRANTS (LION "LEON": UPPER RIGHT & LOWER LEFT/ CASTLE "CASTILLE": UPPER LEFT & LOWER RIGHT). THE PILLARS OF HERCULES ARE LOCATED ON THE OBVERSE (PILLAR SIDE) ALONG WITH THE "STRAITS OF GIBRALTAR" (THE GATEWAY FROM THE MEDITERRANEAN SEA INTO THE ATLANTIC OCEAN). THE ABBREVIATIONS "P.V.A" ARE STRUCK ONTO THE OBVERSE SIDE, WHICH STANDS FOR "PLVS VLTRA" MEANING "MORE BEYOND." BELOW THE PILLARS ARE WAVES OF THE ATLANTIC SEA. THIS GORGEOUS PIECE OF SUNKEN TREASURE WAS RETRIEVED FROM THE BOTTOM OF THE "RIVER PLATE" IN URUGUAY. UNDER THE REIGN OF KING FERDINAND VIth! 1713-59 AND SERVED AS KING OF SPAIN FROM JULY 9, 1746 UNTIL HIS DEATH AND WAS THE FOURTH SON OF KING PHILIP THE VIth! FERNANDO VIth, SPANISH MONARCH IS ACTUALLY WHO ENDED THE "COB COINAGE" AT LIMA!~ INTERESTING ENOUGH WAS FEATURED (FICTIONALIZED VERSION OF HIM, PORTRAYED BY SEBASTIAN ARMESTO) IN "PIRATES OF THE CARIBBEAN - ON STRANGER TIDES" IN THE 2011 MOVIE. IN THE FILM AFTER LEARNING ABOUT THE DISCOVERY OF THE FOUNTAIN OF YOUTH, SENDS HIS MOST TRUSTED AGENT, KNOWN ONLY AS THE SPANIARD TO DESTROY IT, SINCE HE SAW IT AS AN ABOMINATION IN THE EYES OF GOD! THE SHIPWRECK OF NEESTRA SENORA de la LUZ LEFT BUENOS AIRES IN THE SUMMER OF 1752 WITH A GALLEON OF GOLD AND SET SAIL TOWARDS SPAIN. WHILE STOPPING IN MONTEVIDEO FOR PROVISIONS SHE GOT PUSHED INTO THE SHORELINE BY A LARGE STORM, CLAIMING ALL LIVES ON BOARD AND SPEWING HER TREASURE IN A VERY WIDE AREA. APPROX. 90% OF THE TREASURE WAS RECOVERED SHORTLY THEREAFTER; HOWEVER THE POWDER HOLD WAS NEVER FOUND. IRONICALLY THIS IS WHERE APPROX. 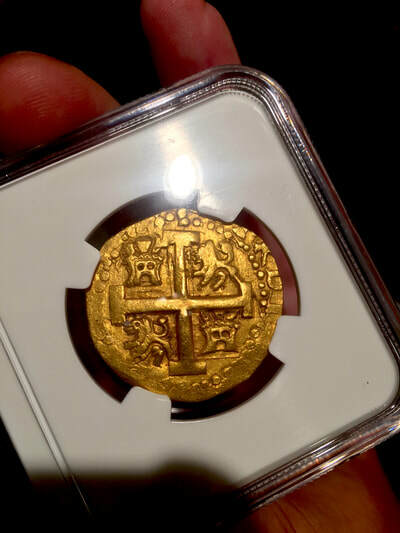 200,000 PESOS OF TREASURE WAS TUCKED AWAY, OVER 250 YEARS AGO. 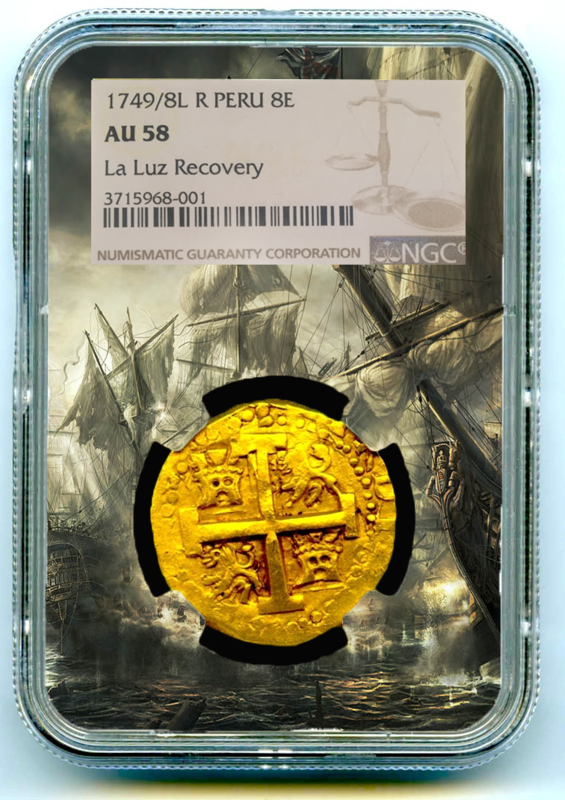 THIS TREASURE WAS DISCOVERED IN 1992 (AND ONLY 2 PIECES HAVE EVER BEEN CERTIFIED BY NGC), AND THE BOOTY WAS DIVIDED UP BETWEEN THE URUGUAYAN GOVERNMENT AND SUBSEQUENTLY SOLD IN AUCTION IN SOTHERBY'S IN NEW YORK. MOST CERTAINLY A RARE DISCOVERY THAT WILL LONG BE A TROPHY PIECE IN A WORLD CLASS COLLECTION! "ONLY 2 KNOWN - SENORA DE LA LUZ"
"SHIPWRECK NUESTRA SENORA DE LA LUZ - LOST 1752! 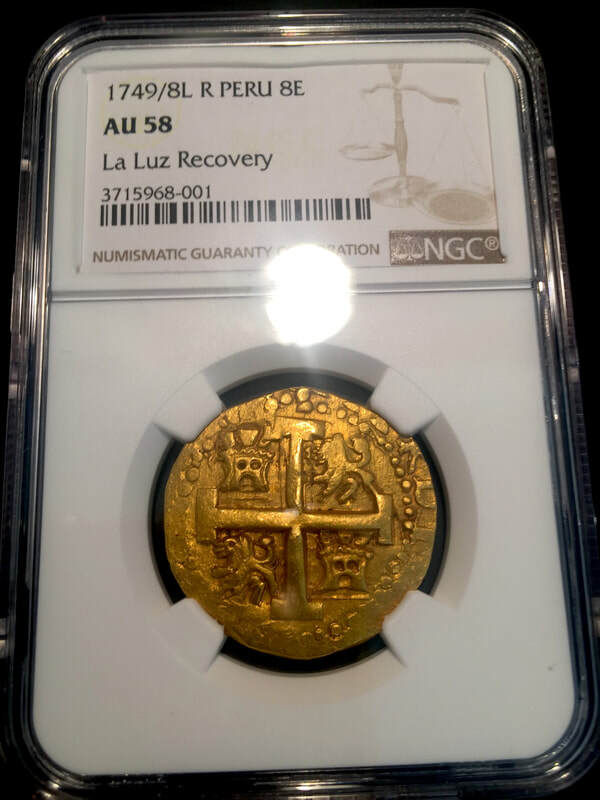 LIMA PERU GOLD COIN 1749/8 "PEICES OF 8" ESCUDOS NGC 58! 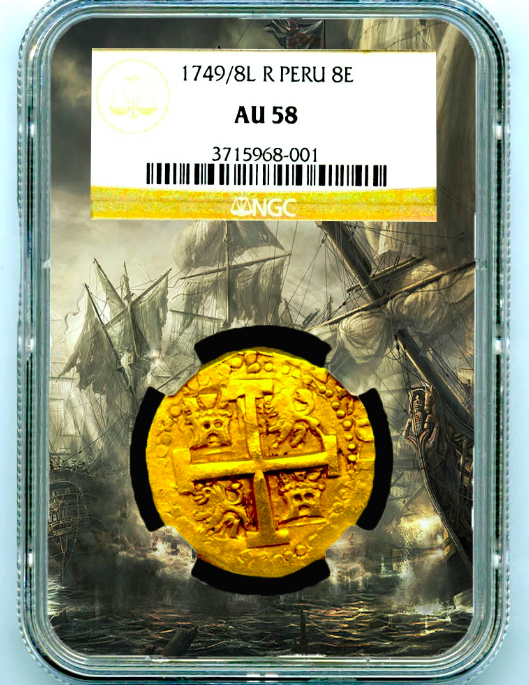 *** THERE ARE ONLY 2 PIECES EVER GRADED BY NGC (THIS IS EASIEST THE NICER OF THE TWO, HAVE SCANS OF THE OTHER PIECE)!!! 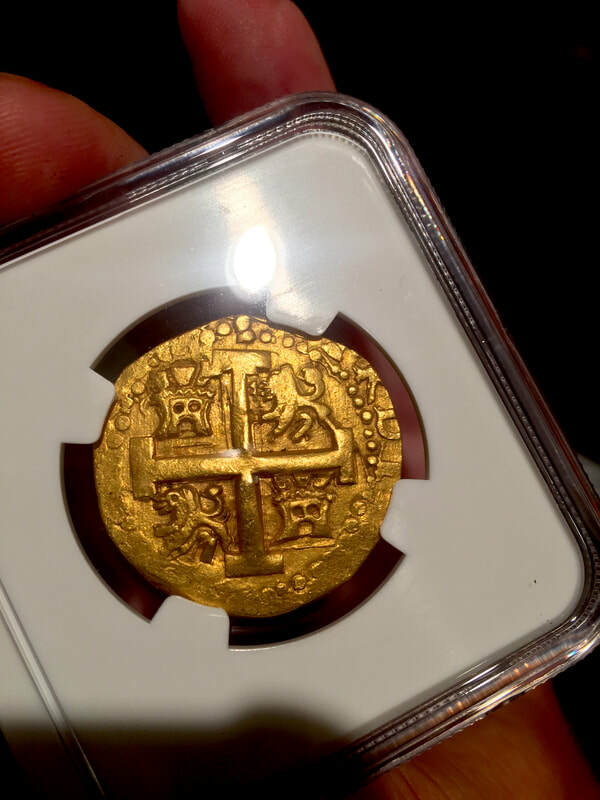 THIS IS NO ORDINARY GOLD DOUBLOON - IT'S A DOUBLE DATE, A MULE PIECE! THAT IS TO SAY MATTY, IT HAS A 1749 FRONT (PILLAR SIDE) AND A 1748 REVERSE (CROSS SIDE)!!! WITH TWO DIFFERENT ASSAYERS AS WELL - PILLAR SIDE STAMPED "R" (JOSE RODRIQUEZ - SEE THE "R" IN THE LEGEND) AND CROSS SIDE IS JOSE de VARGAS! IT'S VERY DIFFICULT TO SEE, BUT THE ASSAYER "V" IS STAMPED TO THE RIGHT OF THE CROSS! 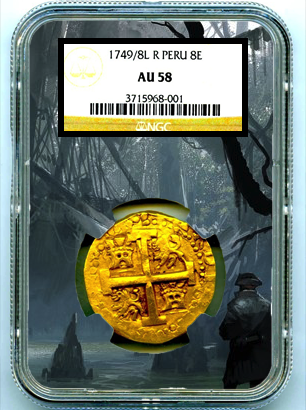 THIS OCCURRED IN RESPONSE TO THE NEW MINT SUPERINTENDENT, ANDRES MORALES, IN 1748, WHOM ARRIVED IN LIMA AND WAS CHARGED WITH CONVERTING THE MINTAGE FROM COBS TO MILLED COINS AND ALSO TO RESPOND TO THE BOARD OF COINAGE WHOM REQUESTED A RE~DESIGN DUE TO FREQUENT MIS~STRIKES AND DUPLICATING (DOUBLING).